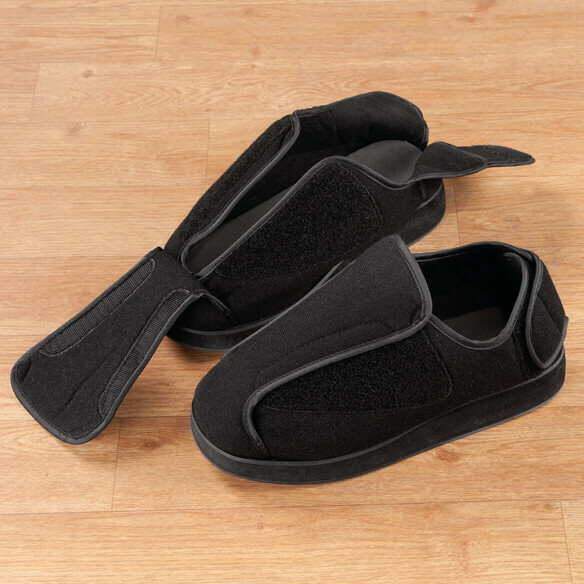 Fully adjustable edema slippers are always a perfect fit, even when feet change from day to day. Unique unstructured design, with hook-and-loop closures at the heel and across the upper, folds open all the way and closes with ease. Simply step in, fold closed and secure to comfortably fit any width. 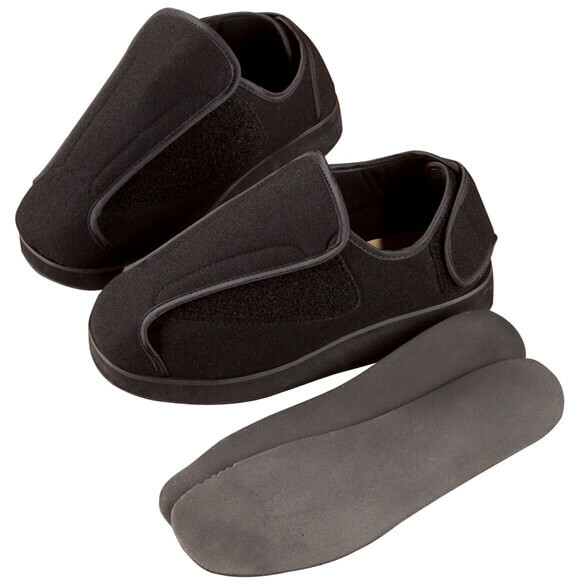 Removable insoles accommodate varying degrees of swelling — ideal for anyone managing edema. 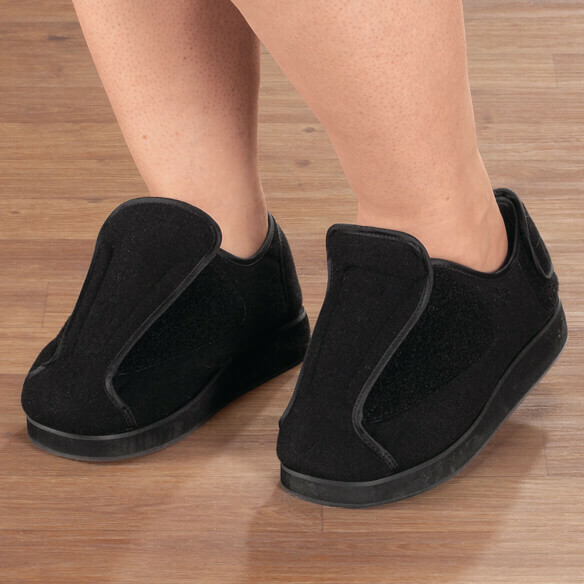 Velvet upper keeps feet warm and cozy. Rubber sole provides a non-slip grip indoors or out. Hand wash velvet slippers with mild soap; air dry. husband has swollen feet and cant get regular shoes on he usually wears a 10and a half I hope these will fit or should I have ordered the 2xl? Due to swollen feet and legs my mother has trouble finding shoes to wear. Hope these will work. I think they are what I was looking for. I have a problem with swelling feet and ankles, can't find shoes to fit. It appears that this design may provide the foot comfort I want. Nothing that I have purchased so far has been satisfactory. 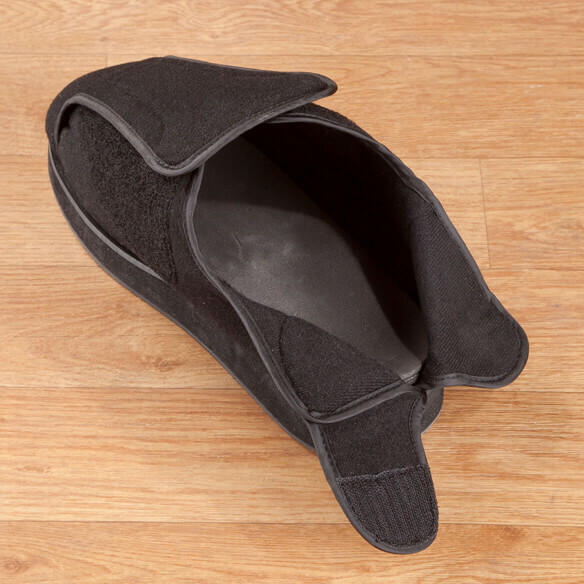 I like the design - very adjustable, with a sturdy sole that can be worn outside. Please clarify your sizing for both men & women... it is not clear. Customer service helped, but was not available the first time I called. I HAVE SWOLLEN DIABETIC FEET, AND THESE SLIPPERS WILL REALLY HELP ME. My mother has severely swollen feet from having diabetes. I think and hope these will work for her. Thanks. I designed shoes for my daughter's painful feet then I searched to see if they existed, and here they were. I hope they work for her. I suggested these to my father in law and hope he will walk around the house instead of socks. My feet need these slippers. Husbands feet are large (size 13 or 14 and presently edemic. Dad has very swollen feet. We’ve tried many others, and these were the only ones that fit. The sizes run pretty big. 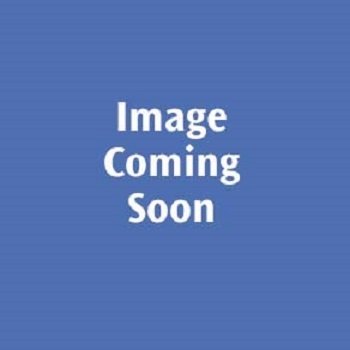 Relative has problems in nursing home with fluid retention. hope they'll work for me because none of my shoes fit when my legs & feet are in lymphedema wraps. edema in left leg due to surgery. What size should I buy for men's size 10? BEST ANSWER: Thank you for your question. Medium fits sizes 9-10 and large fits 10.5-11.5. We hope this information will be of help to you. I wear an orthopedic brace. Plus what size? Could you tell me what size 2xl fits? how many inches is size medium? Neither the size chart nor the description answers this question of actual inch measurements of sole and top diameter. Is there a seam on the inside toe area? BEST ANSWER: Thank you for your question. A medium in womens is 9-10 and large is 10.5-11.5. We hope this information will be of help to you. what is shoe size for 2XL ? BEST ANSWER: Thank you for your question. 2XL will fit men's shoes between 11-11/2. We hope this information will be of help to you. What does large and XL eqate to sizes. For example 10.5 i womans? BEST ANSWER: Thank you for your question. A large is womens 10.5-11.5 and mens 8-9. XL is womens 12-13 and mens 9.5-10.5. We hope this information will be of help to you. do slippers come in size 14? BEST ANSWER: Thank you for your question. No, we do not have that large a size. We hope this information will be of help to you. what size shoe is a small? BEST ANSWER: Thank you for your question. A size small is 5-6 in mens and 7.5-8.5 for womens. We hope this information will be of help to you.